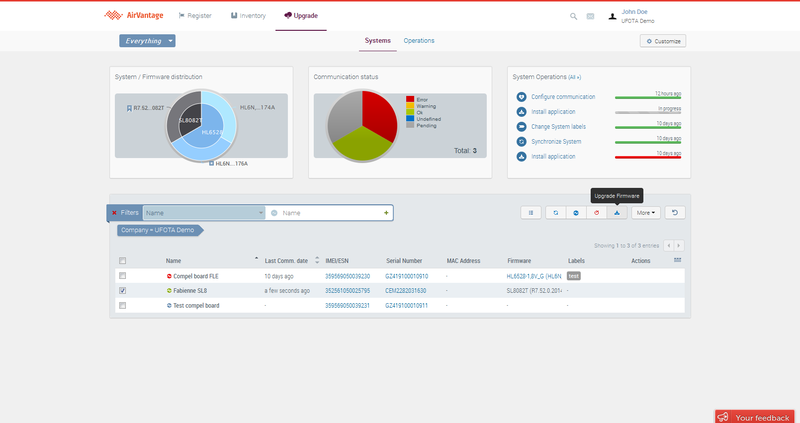 The Upgrade activity helps you manage the firmware for your fleet of systems deployed in the field. It provides access to all the your company’s registered systems, along with their status, last communication, and last reported firmware version. The Systems section. This shows you the status, last communication, and last reported firmware version for all your registered devices. An overview of all Operations launched on your systems, and the status of those operations. Please note that not all functionality provided by the Unlimited FOTA Edition is available for all device types. 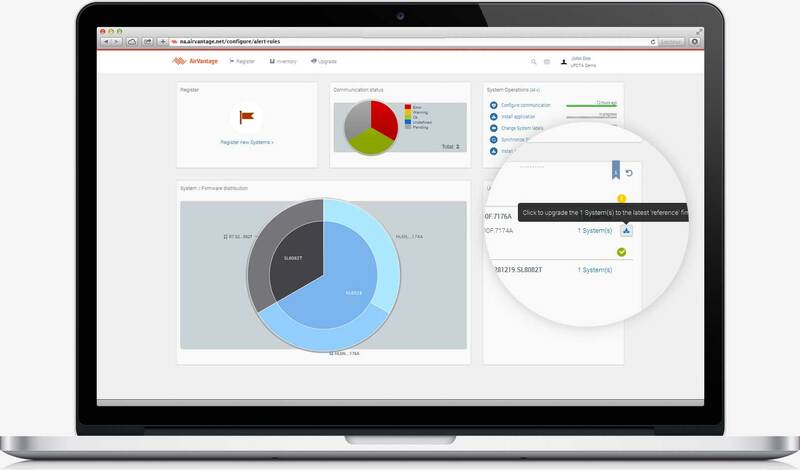 Additional management features are provided to users of the full AirVantage Platform Edition. The Dashboard is user-configurable so you can decide which information is most important, and how it is presented. 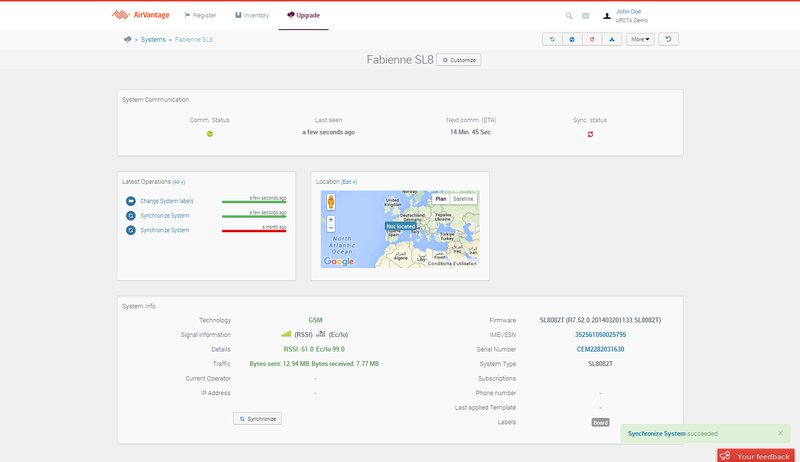 Highlighting distribution of firmware within your fleet, or online status for example. The widgets are interactive, so by clicking on a pie chart segment you will be taken directly to a list of those devices. 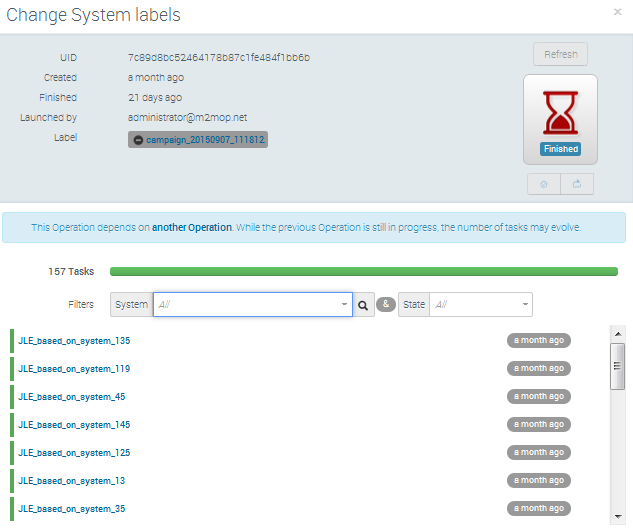 see How to configure your dashboard? for more information. The Systems list shows all the systems READY and DEPLOYED in your company along with some device information. You can find the description of the systems states in the Inventory display. You can also change the display order by dragging a column header, or a column width by sliding the column edge. You can execute a number of device management operations from the Systems list. Details Drill down to the detailed view of one system. Synchronize Retrieve the latest data from selected system(s). Configure Communication Change the heartbeat on one or multiple systems. 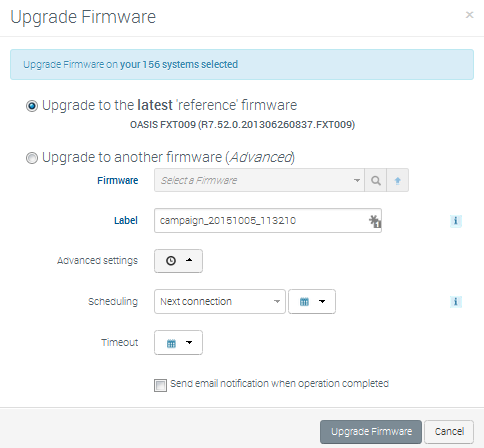 Upgrade Firmware Launches a firmware upgrade on the selected system(s). Edit Change or update the components of your systems, for example to add a phone number to the subscription. Change Labels Add or remove labels. Send SMS Send SMS-based instructions to the device(s). Only available if you have appropriately configured an SMS account. Wake Up Send a wake up instruction to selected device(s). Depending on the capabilities of your system firmware/application, the operations actually available may differ from those listed above. 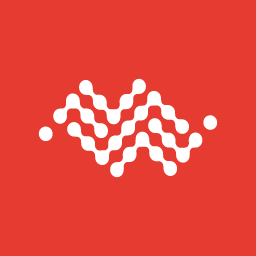 Additional options are available to users of the full AirVantage Platform offer. 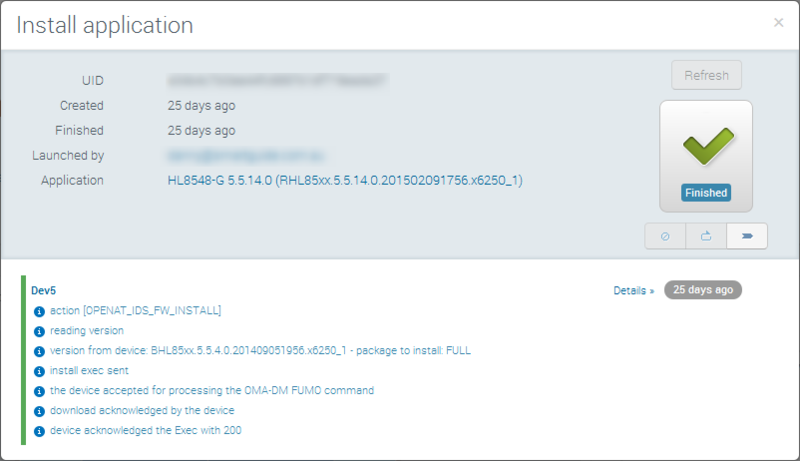 Most recent activity from the device is available from the device details screen. The details of a given system are accessed from the Systems list view clicking on the Details icon in the actions toolbar after selecting a system, or directly in the Actions column of the system. 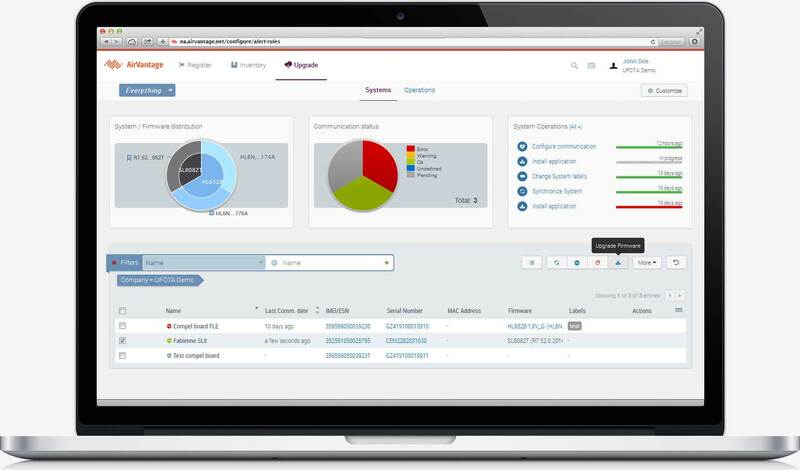 Sierra Wireless team is pushing new firmware packages on AirVantage so you can keep your fleet up to date with the latest features and security patches. 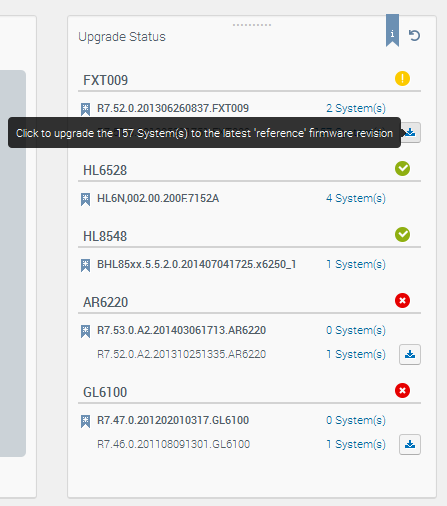 The Upgrade Status widget on the FOTA Edition Start Page identifies systems in need of firmware upgrades, and lets you apply the latest build to all systems of a device type with a single click. When clickin on the icon on the right to upgrade devices in bulk, you will be prompted for confirmation to upgrade to the latest firmware. If you want to choose another firmware than the default one, this will also be possible by searching in the list of available firmware. Upgrade the firmware of one or a group of devices. To check which firmware versions are actually deployed on your systems, use the System / Firmware distribution and Upgrade Status widgets. Once done, refresh the web page and you can see your registered wireless modules with the new firmware version. 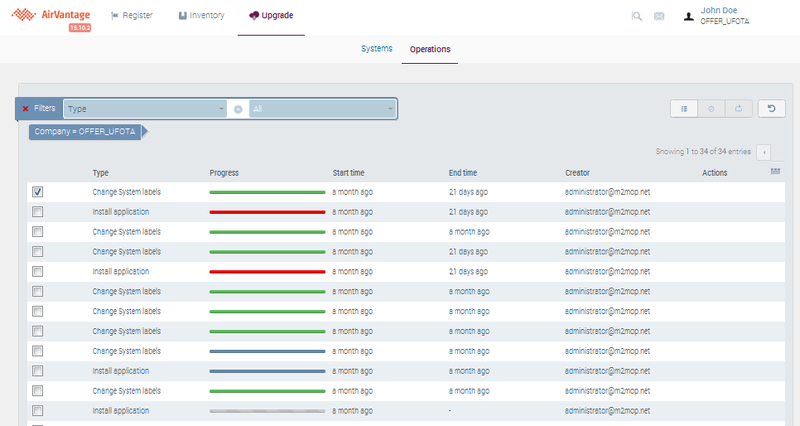 The Upgrade menu’s Operations list displays all the device management operations executed on your fleet. From here, select an operation and click on the View button to drill down and check the details of any operation. To show for example the devices to which it was applied, and why it may have failed. The information shown depends on the type of operation. For certain operations, you may have the option to abort or relaunch. How to upgrade Firmware on my AirPrime module or AirLink programmable modem?